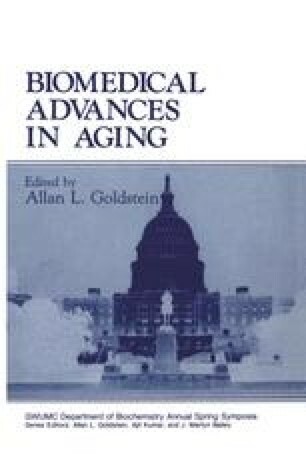 Among the immunologic defects associated with aging is a decrease in humoral immune responses. Much of this decrease in antibody production, particularly in response to T- dependent antigens, is the result of diminished T-cell helper function (Price and Makinodan, 1972; Nordin and Makinodan, 1974, Makinodan, 1972; Krosgrud and Perkins, 1977; Segre and Segre, 1976). However, multiple alterations in B-cell function have also been identified in aged individuals (Callard et al., 1977; Goidl et al., 1976; Kishimoto and Yamamura, 1971; Kishimoto et al., 1976; Zharhary and Klinman, 1983; Zharhary and Klinman, 1986a; Zharhary and Klinman, 1986b). The alterations in B cells of aged mice are generally evidenced in two ways: (1) the decreased amount of antibody production after antigenic stimulation to many but not all antigens (Kishimoto and Yamamura, 1971; Kishimoto et al., 1976; Zharhary and Klinman, 1983, 1986a); and (2) subtle but reproducible alterations in the antibody specificities expressed by immunized aged versus young animals (Goidl et al., 1976, 1980; Zharhary and Klinman, 1983; Szewczuk and Campbell, 1980; Doria et al., 1978). Such changes in B-cell function could be the result of intrinsic differences in the B cells generated in aged versus young individuals or alternatively may reflect the consequences of environmental modulation of expressed B cells that could differ in aged versus young individuals. An example of the latter effect is the well-demonstrated increase in antiidiotype reactivity that appears to accumulate as mice age (Klinman, 1981; Goidl et al., 1980). This increase in anti-idiotypic reactivity dampens the responsiveness of all B cells— even those derived from young mice—when they are placed in the environment of an aged mouse (Klinman, 1981).